Since its launch last month, Thrive at UT has received positive campus media and social media coverage. The free iPhone app, designed to enhance students’ well–being, wellbeing, has been a success with students. Staff members have also received very positive feedback from students. 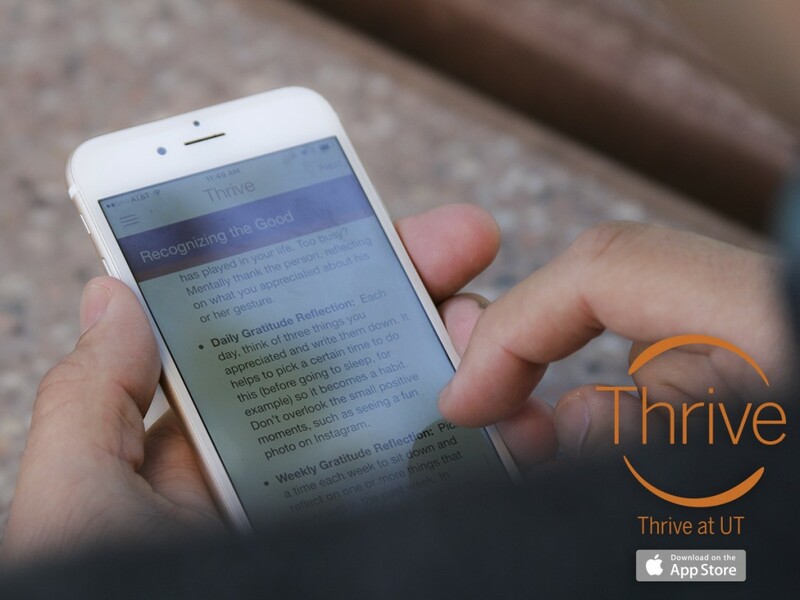 All of the users who took a survey after using the app said they would recommend Thrive at UT to a friend. Staff revamped the student rooms in Littlefield Residence Hall by replacing vanity cabinets and surfaces, sinks and faucets. DHFS saved about $70,000 in construction costs by having internal crews do the work. Neil Kaufman and Lindsey Hutchison manage the first UT Farm Stand event. 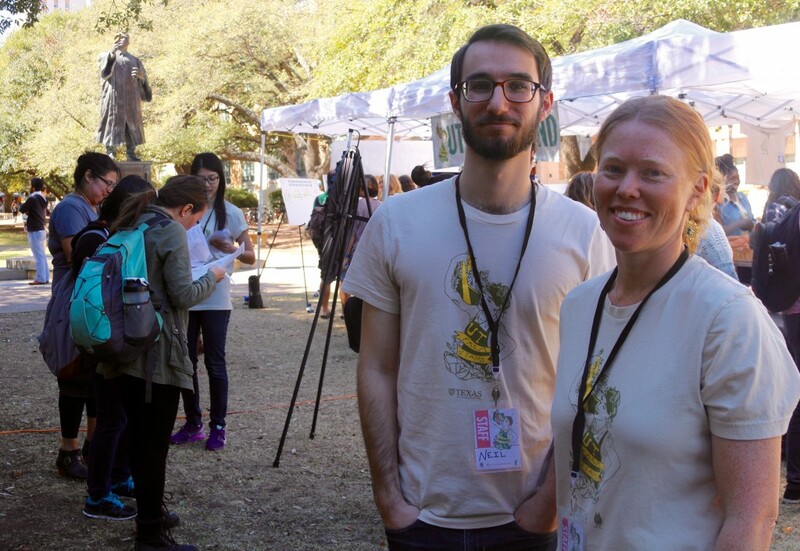 Staff launched the first of five UT Farm Stand events on Feb. 25. Students, staff and faculty lined up to purchase fresh, local produce and baked goods. Read more about the project. See the photos. Staff celebrated Division partnerships and successful student participation at this semester’s GoTX Health and Fitness Fair. 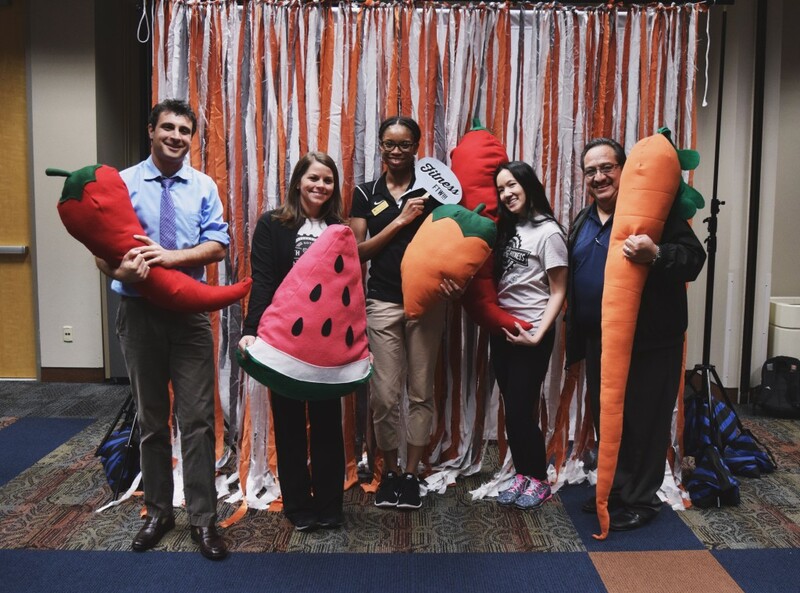 Housing and Food Service, Counseling and Mental Health Center, RecSports and University Health Services hosted the event to help students stay healthy on the Forty Acres. More than 100 students enjoyed snacks, games, and free exercise classes. 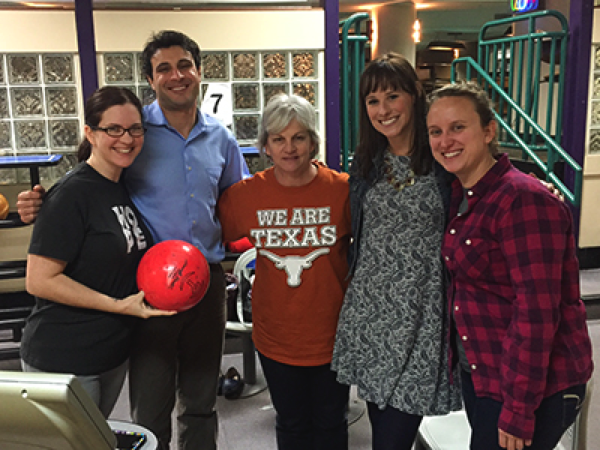 See the photos of staff teaching students about nutrition services, Healthyhorns programs, mental health support and Longhorn Run 2016. 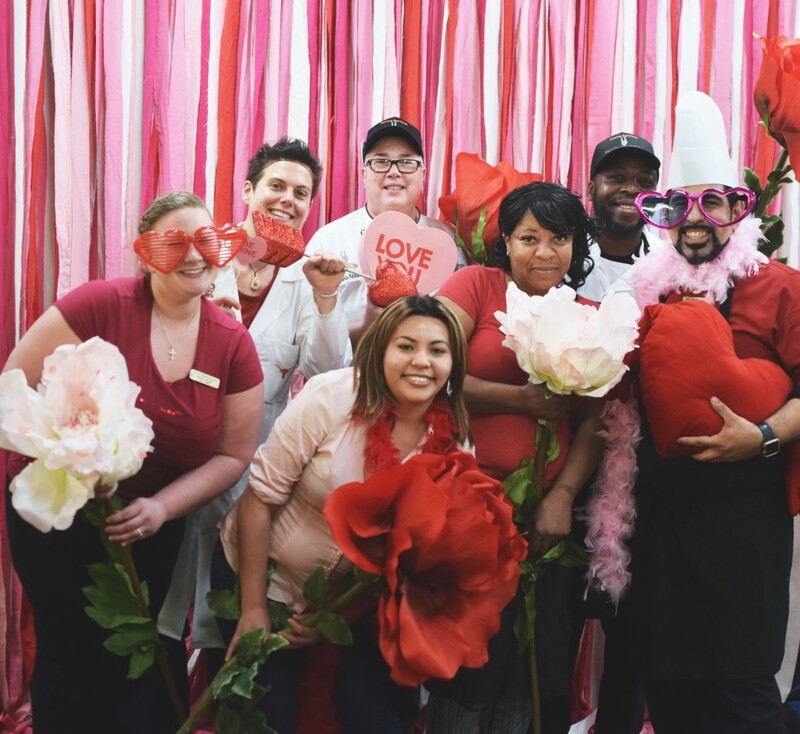 J2 Dining staff prepared a great Valentine’s meal and the marketing team set the scene with fun decorations and a festive photo booth. More than 250 people bought tickets to the event. Relive the holiday through these photos. The orientation registration date for summer sessions has been pushed ahead from March 2 to March 10. 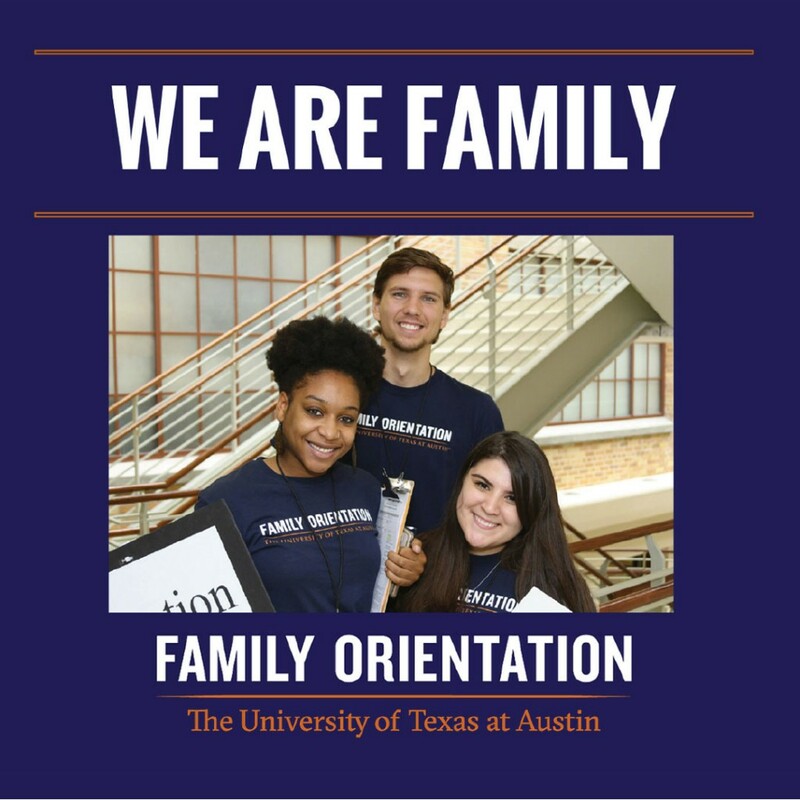 Division staff is encouraged to take a look at the 2016 Freshman Orientation schedule. New Student Services launched a new website on Feb. 15. 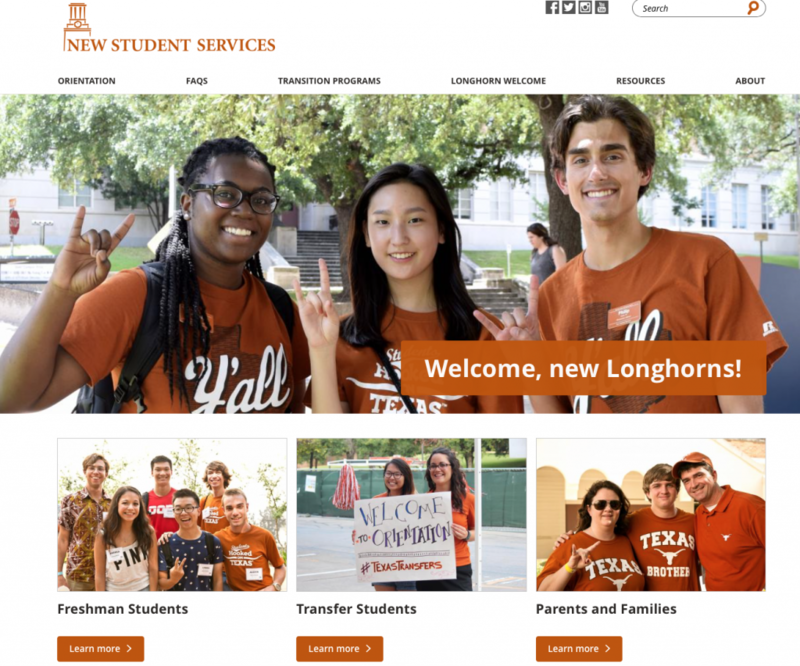 The new site follows the design of the UT Austin core pages. Staff streamlined the content to make navigating orientation easier for students. Freshmen, transfers, parents and families can look at sections geared toward them. Alex Kappus and Esmer Bedia teach a True Colors® seminar. 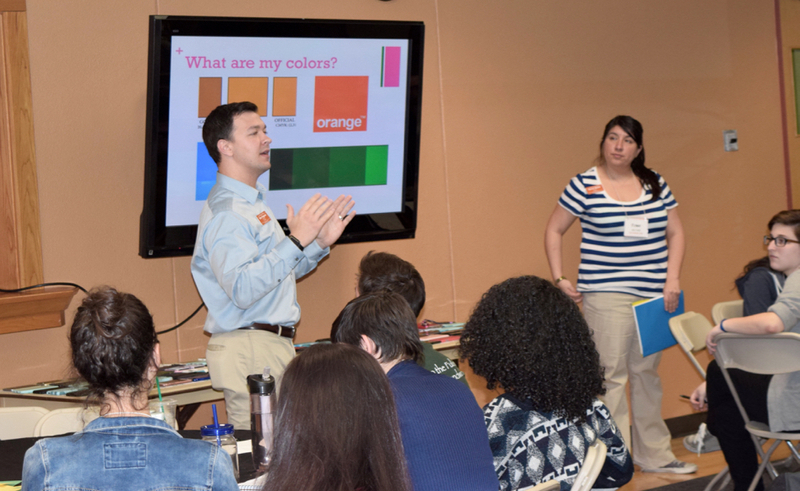 Staff trained new Orientation Advisors and Returning Orientation Advisors at a two-day retreat. True Colors® facilitators helped the group learn their color spectrum and how to apply it to their work during orientation. View the photos. 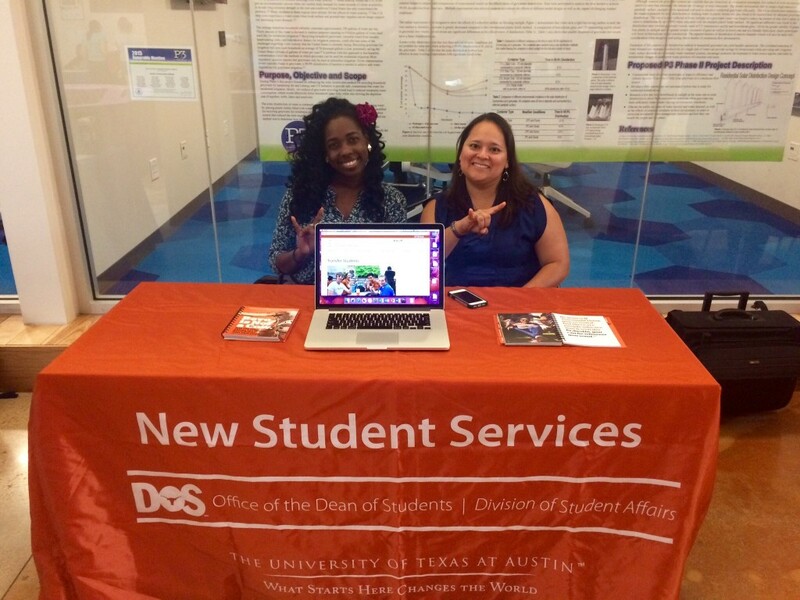 Shannon Price and Desiree Alva inform Austin Community College students about Division programs, facilities and services. In order to reach potential new students, staff members tabled at the UT Marketplace event at the Austin Community College (ACC) Highland Campus. The goal was to connect with students interested in transferring to UT Austin. DoS staff will facilitate another round of campus-wide elections beginning March 2. Staff should talk to students about participating in campus-wide elections, which are held online. Learn more here. 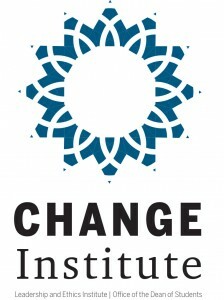 Leadership and Ethics Institute (LEI) staff members are recruiting applicants for The CHANGE Institute: Transforming Self and Community. This free two-day institute, open to all undergraduate students, provides a transformative opportunity to explore issues related to leadership, diversity and social justice. Encourage students to sign up for the event scheduled for April 15-16. Student Activities is gearing up for UT Marketplace on March 23, where vendors can reach UT Austin students, staff and faculty. LEI staff worked hard to host The Texas Leadership Summit, a one-day event for students to sharpen their leadership skills. The Student Activity Center (SAC) team joined those efforts to host more than 150 students. Student Veteran Services educated more than 30 new advisors on federal and state veteran benefits at two training events on Feb. 8 and 22. The workshops focused on how staff can provide better guidance to student veterans. University Communications account managers shared best Twitter practices with Division social media coordinators. The communications team partnered with University Communications to host a workshop for Division communicators. 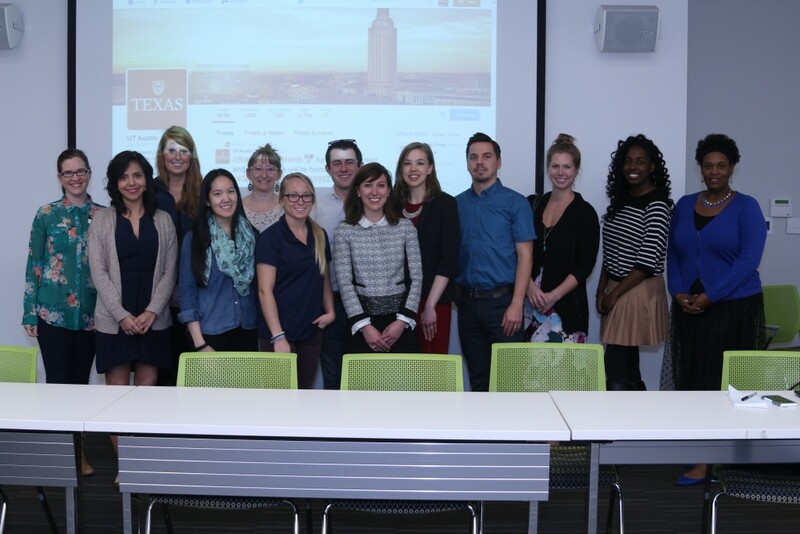 “Twitter Day” provided an opportunity for social media coordinators to share best practices with the managers of the university’s main Twitter accounts: @UTAustin and @UTAustinNews. The group brainstormed new ways to reach audiences by telling compelling stories. See the photos. The University Health Services management team asks questions about leadership during their dance lesson. 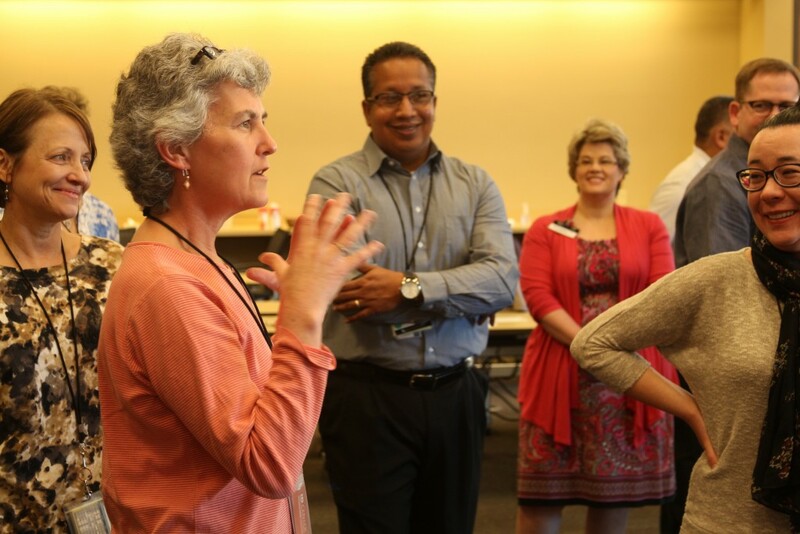 Vice President for Student Affairs Gage Paine led two leadership workshops for New Student Services’ Orientation Advisors (OAs) and the University Health Services (UHS) management team. Paine used dance to teach leadership skills to these groups. Catch the OAs and the UHS staff in action. 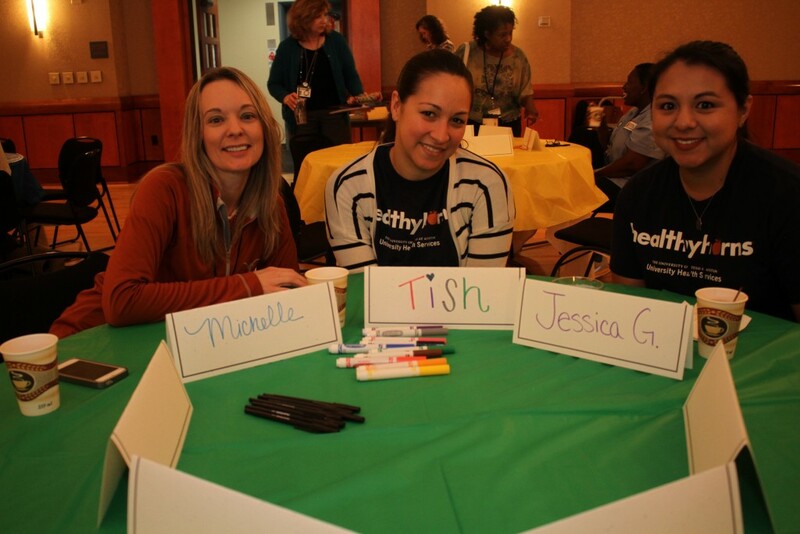 Michelle Jones, Tish Banda and Jessica Garcia (University Health Services) learn their color spectrum. True Colors® facilitators led two introductory workshops for staff who have joined the Division since September. The True Colors®: Keys to Personal Success seminar helps staff members identify their color spectrum and how it can be used to build relationships in the workplace. Check out the photos from the first and second sessions. Take a look at the Recreational Sports Profiles 2014-2015. These 16 pages highlight the department’s progress over the past year. Assistant Director Chrystina Wyatt attended the TexFIT & Friends Conference at Texas A&M University. Fitness directors, instructors and personal trainers shared ideas to enhance fitness services. 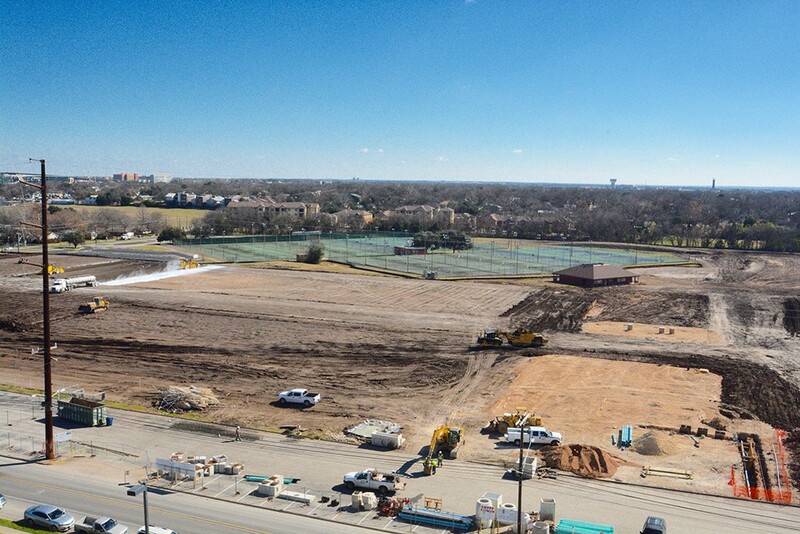 The renovation of Whitaker Fields at Guadalupe and 51 street is underway. Demolition is complete at Whitaker Fields, which closed in October for a comprehensive renovation. Construction is now focused on light poles, synthetic turf, topsoil, the Gateway building exterior, sand volleyball courts and the pavilion. 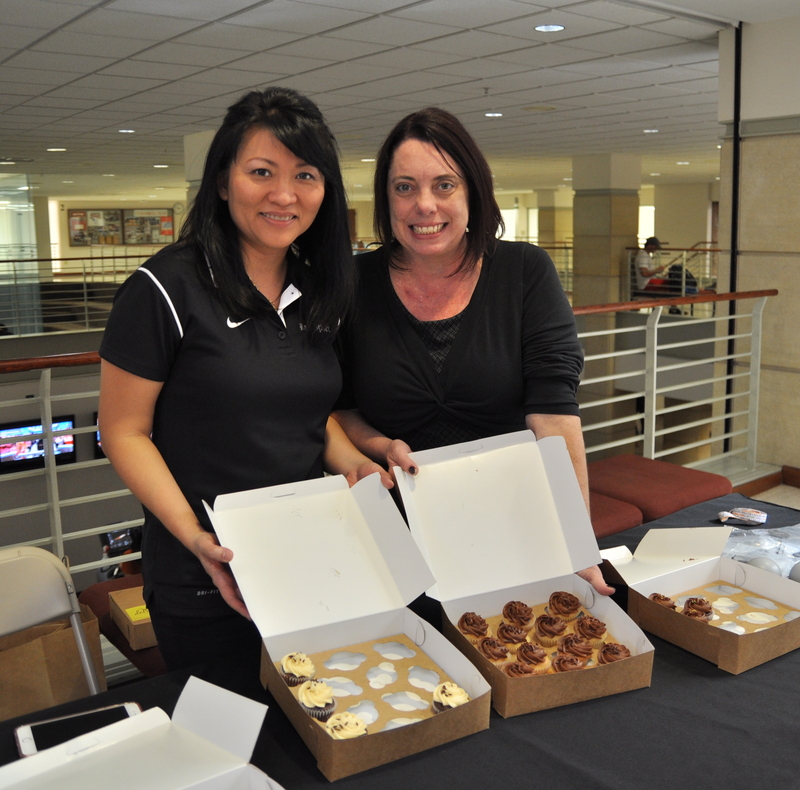 Van Nguyen and Jennifer Morris tempt National Recreational Sports & Fitness Day participants with mini cupcakes. National Recreational Sports & Fitness Day was celebrated on Feb. 24 with free exercise classes, access to the Gregory Gym Climbing Wall, chair massages, fitness/sport club demos and staff handed out sweet treats. Get inspired by looking at these photos. Outdoor Recreation trip guides are leading three exciting trips during spring break: backpacking the Grand Canyon, canoeing the Lower Canyons along the Rio Grande River and maintaining trails in the Gila Wilderness of New Mexico. Register now for Longhorn Run 2016. All UT Austin faculty, staff and students are welcome. Complimentary training is available. Parent program coordinators from other Big XII hear from Vice President for Student Affairs Gage Paine. Texas Parents hosted colleagues from other Big XII Conference schools and neighboring institutions for the Big XII Parent Programs Conference. Guests enjoyed presentations by many accomplished Division of Student Affairs staff members. Check out which Division staff gave informative presentations in the Standouts section. See the photos. Staff is asked to encourage students to apply for two summer positions with Texas Parents. The Family Orientation Student Leader and the Membership Recruitment Student Leader. Direct students to this application. Staff is gearing up for Family Orientation. Registration opens on March 10. Staff is also getting ready to welcome new Texas Parents members who can sign up for a 2016–17 membership starting on March 10. Efforts to promote the 2016 Texas Parents Brick Paver campaign on social media helped boost sales. Brick paver production and installation is underway, with more than 175 new bricks honoring students. All bricks will be placed outside the Student Services Building (SSB) before UT Remembers and 2016 Spring Commencement. Texas Parents will also place 15 memorial bricks outside the SSB to honor students who died in the last year. CSR hosted the writers of the hit off-Broadway play ‘Bill W. and Dr. Bob’ for a reception and discussion. The play is about the formation of Alcoholics Anonymous and the two men who founded the program. 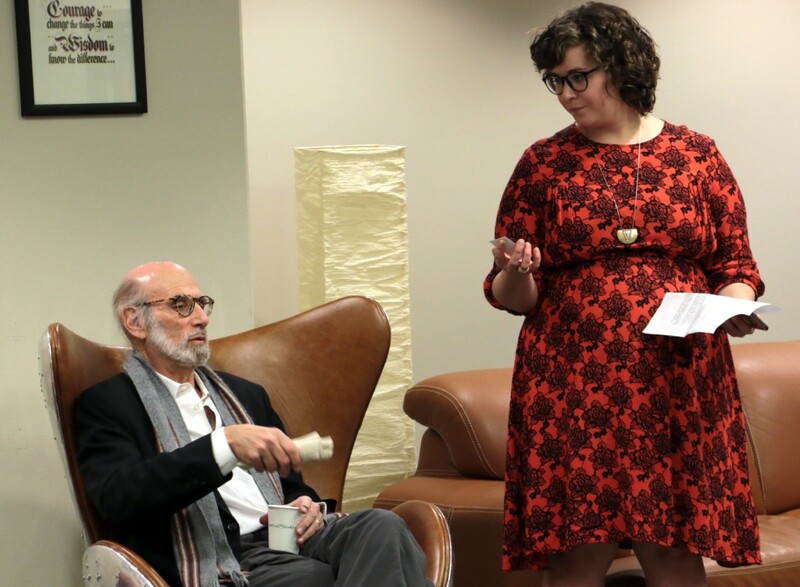 Students, faculty and staff came out to hear Stephen Bergman, who goes by the pen name Dr. Samuel Shem, speak about his inspiration for the show. The play was on stage at the Long Center, where all performances were sold out. Staff will provide a new service to patients. Adrienne Gobe will be providing pelvic floor therapy at the physical therapy clinic. This specialized treatment addresses problems in men and women such as sexual dysfunction, incontinence, constipation, abdominal pain, low back pain, pelvic pain, and preparing or recovering from childbirth. Learn more about this treatment. In preparation for the 2017 accreditation survey, Kerry Aguillon, quality and safety coordinator, studied the standards for continued improvement at a conference led by the Accreditation Association for Ambulatory Health Care (AAAHC). She also represented the university at a state-wide high-consequence infectious disease workshop hosted by the Department of State Health Services. LeAnn Gutierrez represented UT Austin at last month’s Lookout Mountain Group This study group evaluates how various healthcare reform models will impact college students. 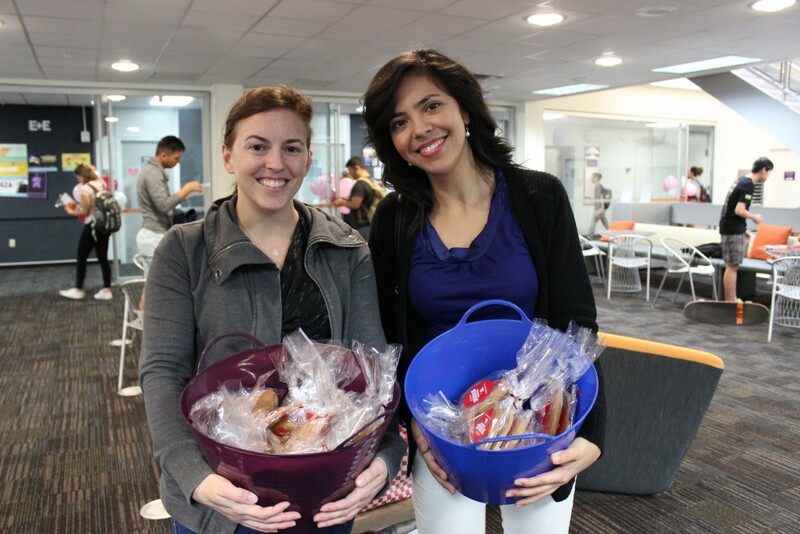 Megan McMillin and Lisa Diaz hand out cookies to students. Staff hand-delivered cookies to students for Valentine’s Day. Campus Events + Entertainment (E+E) also celebrated love with CrushGrams. E+E helped more than 5,000 students send sweet messages to their crush. Take a look at the fun photos. The Unions is holding a second Through Our Eyes Student Photo Contest until March 31. 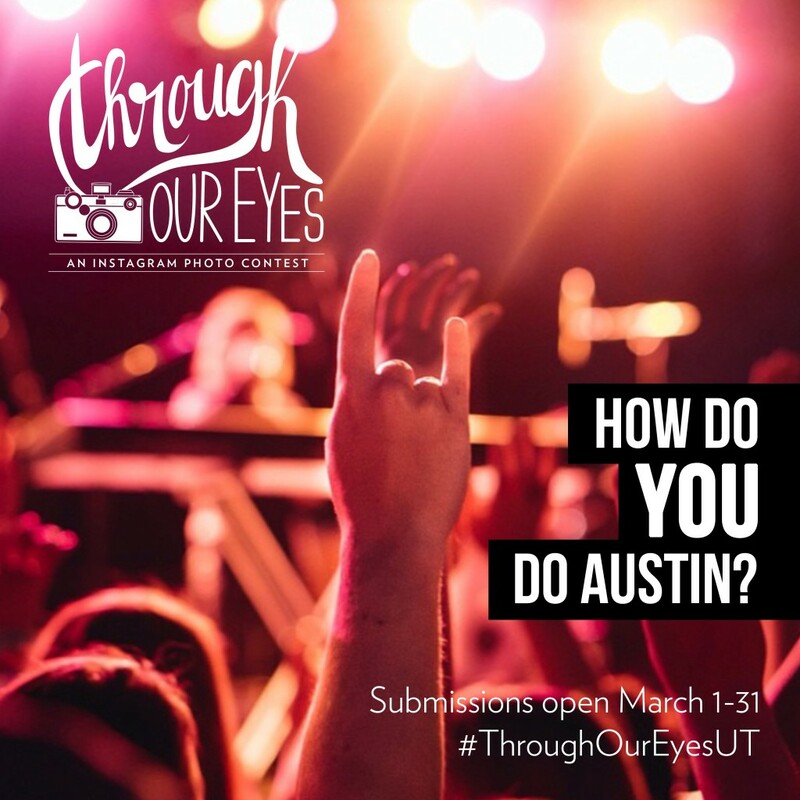 This semester the theme is “How do YOU do Austin?” Students will be able to upload photos to the Unions’ website or submit photos using the #ThroughOurEyesUT on Instagram. The top 15 photos will be placed on display at the Student Activity Center (SAC). Staff decorated the Student Activity Center (SAC) to mark the facility’s facility’s fifth birthday. The building was decked out with balloons, hats, and music. Students and staff also enjoyed birthday cupcakes. See the photos. 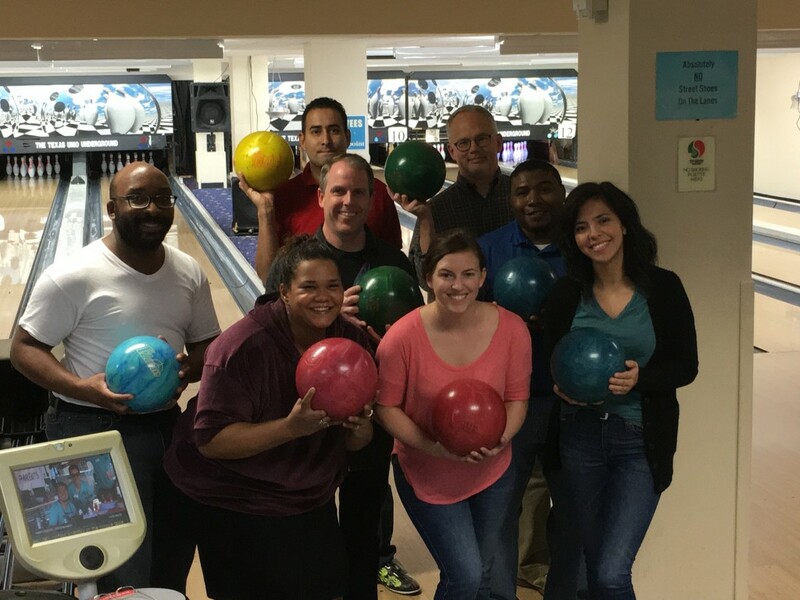 The University Unions Bowling League is an example of how staff members are coming together to get to know one another. They have increased their efforts for teambuilding over the recent months, which included last month’s chili cook-off.